Tell me more about the AfricaWeather App? Our weather app has been designed with our users in mind and is another way in which users can access our weather forecasts and storm tracking while on the go. 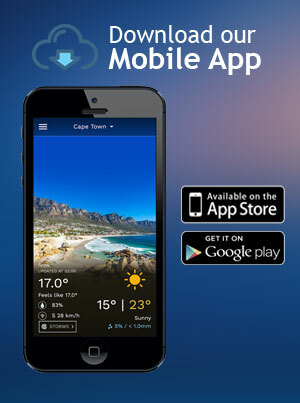 It's simple to use and provides detailed weather data conveniently to your mobile phone. Swipe between locations easily, view seven-day forecasts across four time slots, view a detailed rain forecast as well as detailed graphs and maps. 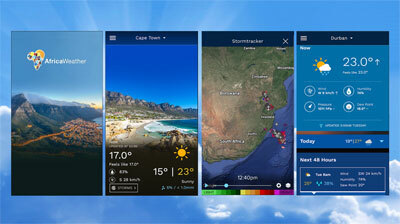 It is the only South African app with built in storm capabilities, allowing you to track storms in real time. Stay informed with customised push notifications for your suburb such as a daily weather forecast, national warnings and the latest weather news. One of a kind notifications include the 30 min prior warning for storms*, unusual weather* and hail risk* for your commute home. We have cool features that allow you to easily check the best time of day to cycle, jog, hit the beach plus loads more. This app is a FREE DOWNLOAD, and gives you loads of free content such as daily weather notices. In fact, we give more away for free than any other website. However, just like our website and mobi site, we have paid-for packages you can choose from that give you even more features and notifications. Our applications work on various devices from BB, Android to iOS - simply click on your devices app store below and download the app today!